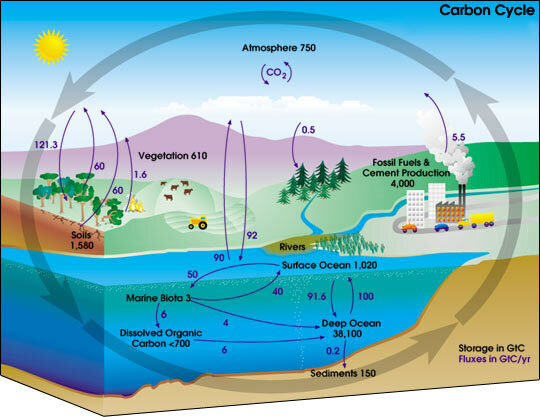 Carbon is exchanged, or "cycled" among Earth's oceans, atmosphere, ecosystem, and geosphere. 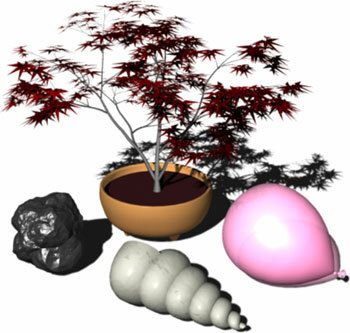 All living organisms are built of carbon compounds. It is the fundamental building block of life and an important component of many chemical processes. It is present in the atmosphere primarily as carbon dioxide (CO2), but also as other less abundant but climatically significant gases, such as methane (CH4). Because life processes are fueled by carbon compounds which are oxidized to CO2, the latter is exhaled by all animals and plants. Conversely, CO2 is assimilated by plants during photosynthesis to build new carbon compounds. CO2 is produced by the burning of fossil fuels, which derive from the preserved products of ancient photosynthesis. The atmophere exhanges CO2 continuously with the oceans. Regions or processes that predominatly produce CO2 are called sources of atmospheric CO2, while those that absorb CO2 are called sinks. CO2 in the atmosphere acts like a blanket over the planet by trapping longwave radiation, which would otherwise radiate heat away from the planet. As the amount of CO2 increases, so will its warming effect. CO2 is the largest contributor (currently 63%) to this effect by long-lived gases and its role increases each year. The additional burden of CO2 in the atmosphere will remain for a very long time, of the order of thousands of years, if we have to rely on the natural mechanisms of erosion and sedimentation to process the added CO2. Carbon (C), the fourth most abundant element in the Universe, after hydrogen (H), helium (He), and oxygen (O), is the building block of life. It’s the element that anchors all organic substances, from fossil fuels to DNA. 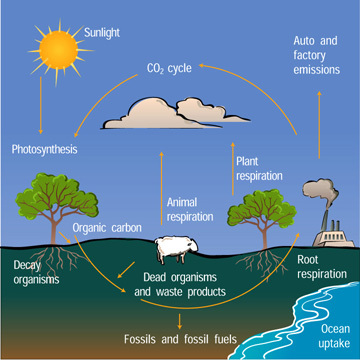 On Earth, carbon cycles through the land, ocean, atmosphere, and the Earth’s interior in a major biogeochemical cycle (the circulation of chemical components through the biosphere from or to the lithosphere, atmosphere, and hydrosphere). 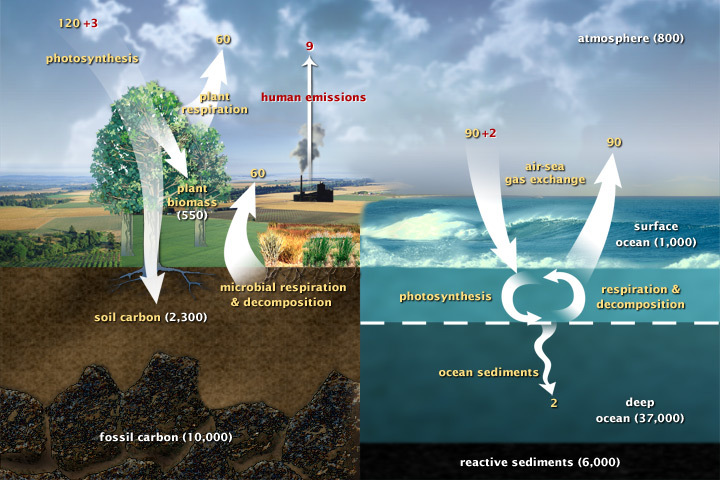 The global carbon cycle can be divided into two categories: the geological, which operates over large time scales (millions of years), and the biological/physical, which operates at shorter time scales (days to thousands of years). Geological Carbon Cycle Billions of years ago, as planetesimals (small bodies that formed from the solar nebula) and carbon-containing meteorites bombarded our planet’s surface, the carbon content of the solid Earth steadily increased. Since those times, carbonic acid (a weak acid derived from the reaction between atmospheric carbon dioxide [CO2] and water) has slowly but continuously combined with calcium and magnesium in the Earth’s crust to form insoluble carbonates (carbon-containing chemical compounds) through a process called weathering. Then, through the process of erosion, the carbonates are washed into the ocean and eventually settle to the bottom. The cycle continues as these materials are drawn into Earth’s mantle by subduction (a process in which one lithospheric plate descends beneath another, often as a result of folding or faulting) at the edges of continental plates. 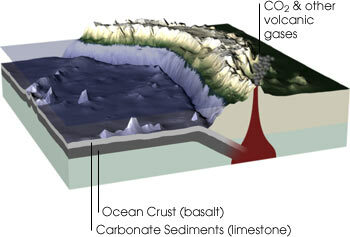 The carbon is then returned to the atmosphere as carbon dioxide during volcanic eruptions. The balance between weathering, subduction, and volcanism controls atmospheric carbon dioxide concentrations over time periods of hundreds of millions of years. The oldest geologic sediments suggest that, before life evolved, the concentration of atmospheric carbon dioxide may have been one-hundred times that of the present, providing a substantial greenhouse effect during a time of low solar output. On the other hand, ice core samples taken in Antarctica and Greenland have led scientists to hypothesize that carbon dioxide concentrations during the last ice age (20,000 years ago) were only half of what they are today. In addition to the natural fluxes of carbon through the Earth system, anthropogenic (human) activities, particularly fossil fuel burning and deforestation, are also releasing carbon dioxide into the atmosphere. 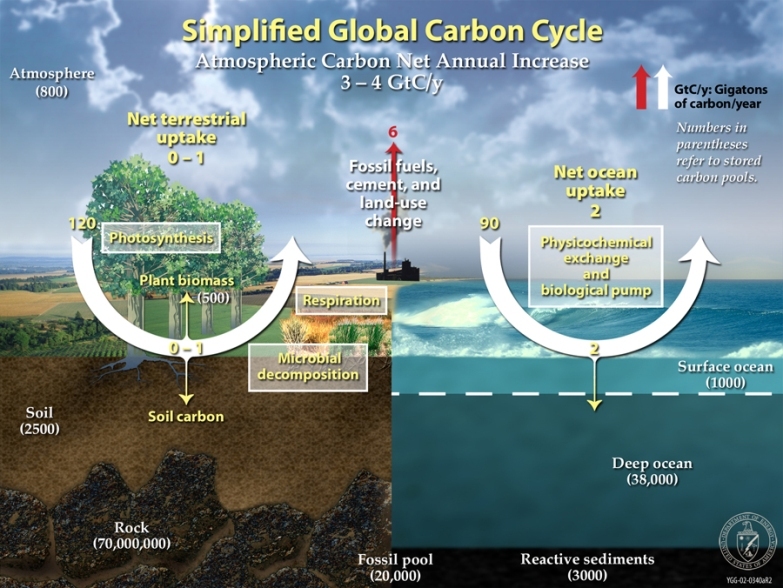 When we mine coal and extract oil from the Earth’s crust, and then burn these fossil fuels for transportation, heating, cooking, electricity, and manufacturing, we are effectively moving carbon more rapidly into the atmosphere than is being removed naturally through the sedimentation of carbon, ultimately causing atmospheric carbon dioxide concentrations to increase. Also, by clearing forests to support agriculture, we are transferring carbon from living biomass into the atmosphere (dry wood is about 50 percent carbon). The result is that humans are adding ever-increasing amounts of extra carbon dioxide into the atmosphere. Because of this, atmospheric carbon dioxide concentrations are higher today than they have been over the last half-million years or longer.